Lights... Camera... TEACH! 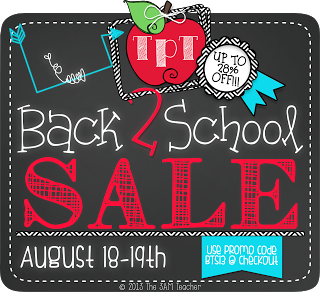 : TPT's Back To School Sale Starts Tomorrow!!! Since we are all teachers here, I know that we LOVE deals. This is why I'm letting you know, if you haven't already heard, that TPT is having their HUGE annual BTS sale! I will be joining in with them to give you the maximum savings of 28% off of anything in my store! Like all good things must come to an end, this sale is only good for 2 days - Sunday and Monday. So start window shopping and wishlisting so that you have your cart all ready with amazing resources at their lowest prices! Don't forget to give feedback to products that you've already purchased. It's like FREE MONEY ya'll!!! And you knoooow... FREE is the perfect price!! I know that I will be shopping around and filling up my cart with things that I've had my eyes on and making sure I get all my feedback in from the purchases I've made so that I can pay even less with the credits I earn.